NASA set for first 4K live-stream from space | What Hi-Fi? While it's becoming more available, 4K content is still a little thin on the ground. But here's one piece of 4K content that's going to be quite literally out of this world: a live-stream from space. On the evening of Wednesday 26th April, NASA will live-stream a roundtable discussion taking place on the International Space Station. 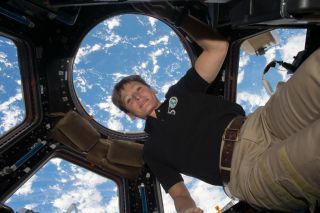 The powwow will feature legendary astronaut Peggy Whitson, and be beamed back to Earth in 4K Ultra HD resolution - no mean feat, considering most TV broadcasters haven't got to grips with 4K yet. Of course, to see it in all its glory, you'll need a 4K TV or monitor. If you don't have the right kit, you can watch a low-resolution version on the NASA Facebook page or NASA TV. The live-stream is being carried out in conjunction with Amazon Web Services, the e-tail giant's cloud computing arm and can be viewed here. 4K footage has been beamed from space before, but never live. The footage will be filmed using a RED Dragon Digital Cinema Camera. The discussion itself could also prove interesting for anyone interested in image quality, cinema and space. It's titled 'Reaching for the Stars: Connecting the Future with NASA and Hollywood', and will explore how "advanced imaging and cloud technologies are taking scientific research and filmmaking to the next level". The fun starts at 6:30pm UK time on the 26th. We'll see you there!